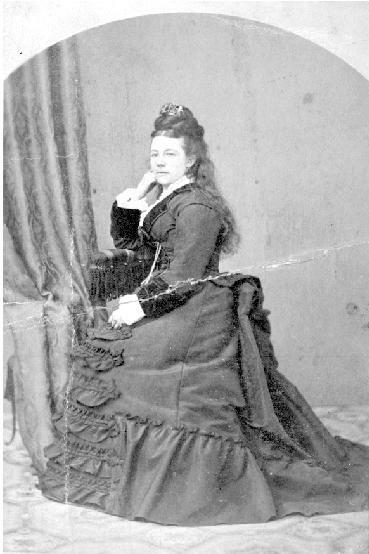 Margaret McMicking, nee Leighton, arrived in Victoria in 1864 with her mother and three brothers from San Francisco a ship called the S.S. Nevada(1). A fellow passenger, actress Julia Dean Haynes, may have inspired her for a life-long involvement with arts and music. Margaret first met her future husband, Robert in Lytton in her uncle’s office. Her uncle was involved in the telegraph industry as was Robert. (2) After an introduction and two and a half years of correspondence of “beautiful penmanship and lovely composition,” Robert wrote to Margaret’s mother in which he made his formal proposal for Margaret’s hand in marriage. Margaret would later recall, “It [was] a model of old-fashioned propriety, couched in the most dignified yet flowery language, and embellished with many flourishes and artistic capitals.” (3) After their marriage in 1869 and a brief stay in Yale, Margaret and her husband moved to Victoria. Margaret’s dislike of moving pictures may be but one aspect of her fondness for the days of old Victoria. Her scrapbooks, written in the early 20th century are full of nostalgic memories of Victoria. Several articles and clippings in these scrapbooks relate to her involvement with St. Andrew’s Church which she obviously treasured along with markings of milestones in Robert McMicking‘s career as a telephone and electricity pioneer. A proud imperialist, she often impersonated Queen Victoria during civic celebrations. (1) British Colonist, “50 Years Ago Today,” Index of Historical Victoria Newspapers, September 14th 1913. (2) The Pioneer Women of Vancouver Island, 248.